The transportation and logistics industry is the backbone of the global supply chain. As a part of that, your enterprise has to be able to rely on its own resources to ensure the safety and security of workers and shippable goods. 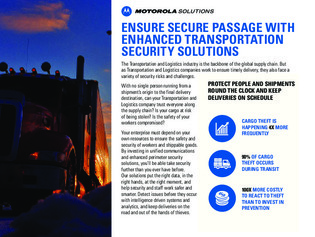 This resource explores how investing in unified communications and enhanced perimeter security can help put the right data in the right hands at the right moment, and keep logistics moving forward at the pace of digital business. Find out how to enable secure, nationwide push-to-talk communications with WAVE two-way radios and more.